Internet marketers know that using pay-per-click (PPC) advertising is a brilliant way to drive traffic to their websites. By implementing well-placed, keyword-based PPC ads, Internet marketers can swiftly and economically produce more leads, and increase revenues in a short period of time. However, as you manage a few PPC campaigns, making silly and sometimes not-so-silly mistakes with PPC programs is common. Some of such mistakes include lack of testing, mistakes when creating the ads, click fraud detection, and more. Your goal should be to minimize these mistakes as much as possible, which can lead to savings of thousands of dollars and even an extra 70% of revenue. 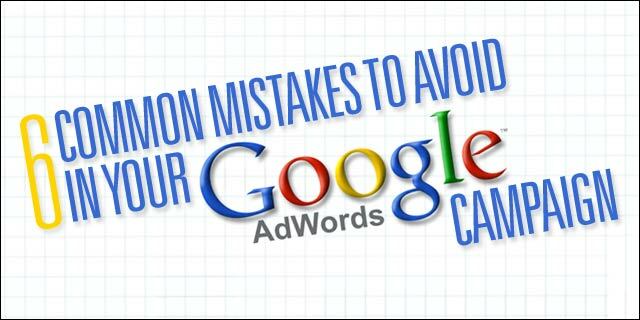 This post aims at presenting the most common PPC advertising mistakes that can be avoided on your way to a highly successful AdWords campaign. The first mistake that can be avoided when running a PPC AdWords campaign is using broad search keywords. Broad search keywords and terms are never recommended since there is usually tough competition for generic keywords that never let your ads rank high in search results. To achieve results, it’s important that you restrict your PPC keywords to the searches your prospective customers are using to reach out to you. Not putting relevant keywords in the ad copy is another mistake that most Internet marketers make. Putting keywords in your ad copy is important because it highly improves the chances of your ad getting clicked on. Always try and put your keywords in the ad title, but if it gets difficult due to character limitations, put it in the ad description – but do get that keyword in the ad copy somewhere! Remember, you need to track each click from your campaigns by keyword, ad group, and campaign if you wish to achieve outstanding results. To calculate the ROI properly, and the effectiveness of each keyword in your campaign, create unique identifying tracking URLs that you can integrate with any web analytics software. Using one campaign for both display and search ads is another common mistake that PPC marketing professionals make. Note that both areas are dissimilar to each other and your prospective customers will not have equal reactions to both. While search ads should be short, crisp, and convincing, display ads should be alluring and have more substance. A major part of Internet marketing success lies in searching for your competition and, after that, raising your bar. Therefore, as a PPC marketer, you must check the PPC ads of your competitors to avoid replicating anything they are doing. Last but not the least: don’t take the trouble of creating a complete PPC advertising campaign if what you put up is just a worthless ad. Be certain that whatever keywords you use are prominent in your ad’s copy. Also, take care that your ad makes complete sense for the terms and keywords you have chosen. Kia Barocha is a content marketing strategist at ISHIR Inc., a leading Digital Marketing Agency in Dallas, providing result-oriented local search engine optimization (SEO), pay per click (PPC) management, social media marketing (SMM) consulting and mobile marketing services.